Because we got our start in training workers at paper manufacturing facilities, and because that’s still a core part of our customer base (even if we’ve expanded quite a bit beyond that), we’ve been writing some blog posts recently specifically geared toward training at paper manufacturing facilities. If you’re not a paper manufacturer, it’s OK–what you’ll read below is true for any job training. So don’t let that introduction scare you away. What we’re going to cover below are a few things to make sure your training is doing what it’s supposed to do–preparing workers to do what they have to do on the job. Managers and owners at paper manufacturing facilities (and other places too) are willing to provide training to employees because it makes the employees more qualified to perform tasks on the job. Maybe this means the employees can perform the job better, or faster, or with less waste, or with greater safety, but it still gets down to teaching people to do real-life tasks on the job. It’s about on-the-job performance, improving on-the-job performance, and ultimately it’s about creating gains for the business as a whole. You can then move on to perform a task analysis, write learning objectives, create tests/evaluations, and create training materials to teach people in various job roles the tasks that they must perform on the job. We’ve covered some of those already in existing blog posts –just click those links you may have skimmed past. But for now let’s take a closer look at identifying job roles and the tasks performed by people in those job roles. This one should be easy enough. If your ultimate goal is to create training to prepare employees for all the job roles at your site, you should create a list of all the job roles. Seems obvious enough, huh? So start by creating that list. There’s a good chance that your friends in HR have this already, or at least part of one. You can also touch base with department managers and supervisors to make sure you’ve got all the job roles. Creating this list will help the training program, but if nobody’s created a solid list in a while, you may wind up helping your coworkers in some other departments as well. A list of job roles at your company is a help to everyone. 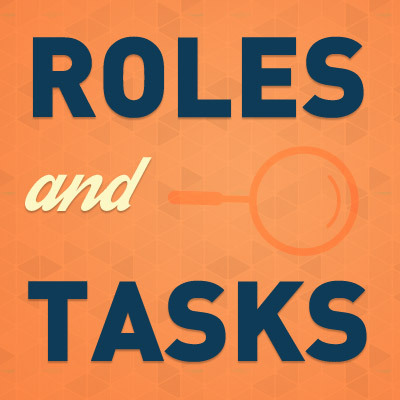 Once you’ve created a list of each job role at your site, now it’s time to sit down and come up with a series of related lists: the job tasks that people have to perform when assigned to each of the job roles you already listed. Ideally, you’ll create a list of ALL of the job tasks for each job role. But it’s OK to start with the most critical tasks first. These might mean the taks that contribute most to creating a high-quality product at a low expense and/or the ones that are necessary for job safety. If you go this route and list the most critical tasks, you can still add more tasks to the list later. Now just continue, creating a list of tasks performed by the people in each job role, and you’ll be good to go to the next stage, which is called the Job Tasks Analysis. In the next step, explained in our blog post about the task analysis, you’re going to take each of the tasks you’ve identified and break the task down into a series of steps. These steps will match the actual steps that a worker has to perform to complete the task on the job. Then you can use that task analysis to create your learning objectives, which is the set of things you want your workers to be able to do when training is complete. And from there, you can move forward to creating your tests and then create your actual training materials. Then, of course, you’ll deliver the training, evaluate the training, revise and/or otherwise improve the training, and keep the cycle going over and over in a virtuous cycle of continual improvement. Hopefully, you see the importance of creating a list of the job roles at your work site and then creating a list of the tasks that people in each job role must perform. At its root, this all gets down to giving you some tools to help create effective training materials that help prepare employees to perform real-life, real-job, real-world tasks at work. And it will help you avoid creating a bunch of training materials that have no real-job value, too. This is even better for a few other reasons. First, if you’re preparing workers to do the tasks they need to do in their jobs, you’re helping your business reach its business goals. And ultimately, that’s what job training is for. And second, it helps set you up for the task analysis, creation of learning objectives, and creation of your tests and training materials, which we’ve already hinted at. Before you dash off, why not download our free guide to learning objectives, below?